This week’s episode is all about producing awesome cannabis events. In Southern California, and in many places around the US – and world, there are non-stop cannabis events going on most days for the week. How do you make your event stand out? How do you make your event the one people want to attend? If you haven’t met Courtney Freeman yet, you’ll be happy you are now. Courtney Freeman is the CEO of White Buffalo, a forty-year-old rolling-paper company. Courtney specializes in creating event experiences and products that leave people wanting more. Join us to learn how you can sell out your next event (and all the events after it)! Courtney Aura Freeman is the CEO of White Buffalo, a forty-year-old rolling paper company. With a new CBD Massage Primer and more products on the way, White Buffalo is quickly expanding market share in the cannabis, hemp, and accessory markets with eCommerce site WhiteBuffaloSpirit.org. 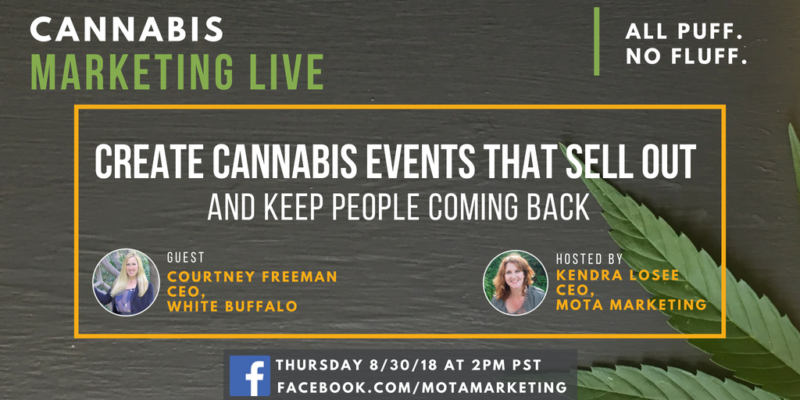 Courtney’s background covers 20 years of award-winning sales, marketing, and product development spanning the financial, tech, entertainment and cannabis industries. After graduating from Columbia University, she began her career working with one of the world’s largest financial institutions on Wall Street and later supported multi-million dollar projects in studio films. Today, Ms. Freeman is focused on merging her commercial ventures with fundraising for philanthropic organizations, raising awareness for environmental concerns, conducting educational speaking engagements, and building community in the cannabis space.